Be placid. Don't complain. Spy on your neighbors and report everything. Let the politicians do your thinking for you. Don't read the paper or watch the news. Don't form opinions. Accept that in order to be safe you must give up your personal freedoms. Now, ignore what you just read and THINK FOR YOURSELF! Don't let them PUSH YOU AROUND. USE YOUR BRAIN. READ A BOOK. QUESTION AUTHORITY. 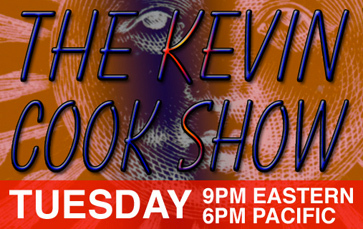 And especially, READ CONSPIRACY JOURNAL EACH AND EVERY WEEK! 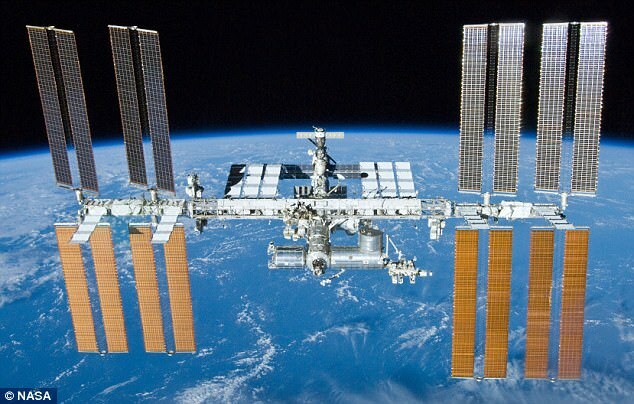 AND: Police Catch Man Prepared to Battle "Lizard People"
Scientists have found living bacteria that could be from outer space on the surface of the Russian segment of the International Space Station (ISS). They are being studied on Earth but most likely they don’t pose any sort of danger, Russian cosmonaut Anton Shkaplerov announced recently. Spacewalkers regularly take samples and materials from the outside of the station when they head outside for what are officially called "extravehicular activity". Those samples are then taken down to scientists on Earth, who study them to understand the workings of the International Space Station and possibly life in space. It isn't entirely clear where the rumoured organisms are currently being stored, and what scientists know about them. Finding bacteria that came from somewhere other than Earth would be one of the biggest breakthroughs in the history of science – but much more must be done before such a claim is made. Earlier this year, Russian scientists announced that the "Test" experiments had found a range of different organisms that had been brought up from Earth and seemed to be surviving by clinging onto the ISS's hull. They included plankton and bacteria that had been pulled up by a phenomenon that lifts micro-organisms up into the heights of the atmosphere. "Experiments of various years have revealed fragments of Mycobacteria DNA - a marker of heterotrophic bacterial sea plankton in the Barents Sea; the DNA of extremophile bacteria of the genius Delftria; the DNA of bacteria closely related to those found in soil samples from the island of Madagascar; vegetative genomes; the DNA of certain species of Archaea and the DNA of fungus species Erythrobasidium and Cystobasidium," the Russian space agency Roscosmos said in a statement obtained by TASS that was published in May. Though it is a little known fact, the truth is that certain individuals with ties to the Canadian government have secretly been promoting the idea that UFOs are operating in Earth's atmosphere and are piloted not by "monsters," but by a group or groups of individuals who are as human as we are but are technologically more advanced than the human race. Former Canadian Defense Minister Paul Hellyer (1963-1967) shocked the media several years ago by stating that he was convinced that off-world visitors have been zipping across the heavens for thousands of years, and that it's not impossible that aliens have infiltrated our society and are walking the streets undetected because they resemble us almost identically. But as much attention as Mr. Hellyer's remarks might have gotten in the press, many decades before, another Canadian had made similar bold remarks concerning Ultra-Terrestrials coming here either from other planets or from a parallel universe. 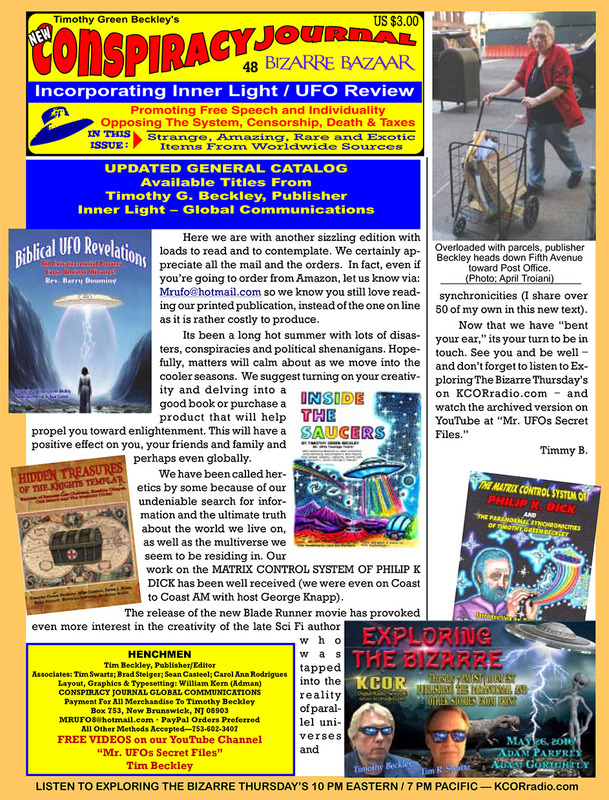 *** So let us begin by journeying back in time to when UFOlogy was young and the groundwork was being laid for the greatest cosmic adventure the world has ever experienced. 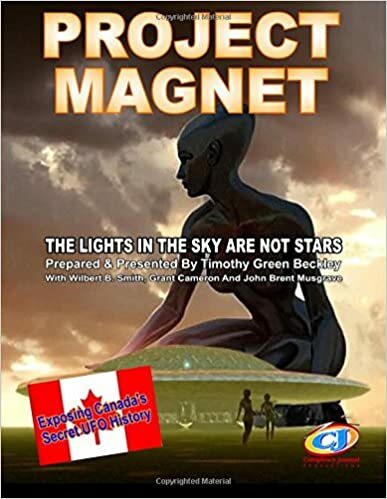 "Project Magnet" tells the story of a Canadian radio engineer's transformation from scientific, nuts-and-bolts UFO researcher to ardent follower of the Space Brothers' philosophy. *** We are currently engaged in a crucial metaphysical battle against the forces seeking to destroy mankind. Can we align ourselves with the good forces seeking our salvation? Is it too late to redeem our race from destruction and damnation? 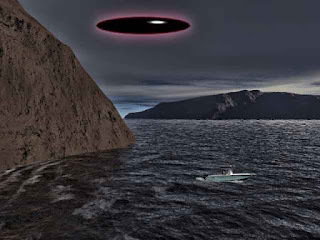 *** Are the flying saucers sent to Earth by God Almighty? Are they His cosmic sign that eventually love will conquer all? "Project Magnet" offers hope in our potential rescue along with hard scientific data on the UFO phenomenon. Even as an ardent student of UFOlogy, you may not know the name of Wilbert Smith. He is an unsung hero in the field, but remains indisputably important in the more than 50 years since his death in 1962. Global Communications CEO Timothy Green Beckley has recently assembled a book that pays tribute to Smith and the 1950s, the era in which Smith pursued the truth of the UFO mystery. The new book is called "Project Magnet," with the subtitle - "The Objects in the Sky Are Not Stars!" Beckley writes in his introduction: "Almost forgotten these days, Smith was a highly-educated engineer who coaxed the Canadian government into establishing Project Magnet, a threadbare project to study and treat reports of UFOs seriously so as to determine who - or what - might be behind this mysterious phenomenon that was seemingly taking over the skies of North America after the end of the Second World War." Project Magnet began operations in 1950 with the purpose of studying, among other occurrences, magnetic phenomena. Wilbert Smith, a senior radio engineer from the Canadian Department of Transport, was put in charge of the project. The goals of Project Magnet were fueled by the concepts of geo-magnetism, and the belief that it might be possible to use and manipulate the Earth's magnetic field as a propulsion method for vehicles. Smith came to believe that this technology already existed in the mysterious UFOs that had been sighted so frequently in Canada, the U.S. and the rest of the world. He felt that the "correlation between our basic theory and the available information on saucers checks too closely to be mere coincidence." Nevertheless, Smith's approach to the study of UFOs was a pragmatic one. "It is perfectly natural in the human thinking mechanism," Smith wrote, "to try and fit observations into an established pattern. It is only when observations stubbornly refuse to be so fitted that we become disturbed. When this happens, we may, and usually do, take one of three courses. First, we may deny completely the validity of the observations; or second, we may pass the whole subject off as something of no consequence; or third, we may accept the discrepancies as real and go to work on them. In the matter of saucer sightings, all three of these reactions have been strikingly apparent. The first two approaches are obviously negative and from which a definite conclusion can never be reached. It is the third approach - acceptance of the data and subsequent research - that is dealt with in this report." To this day, there has never been a clearer statement of how to take an honest and open-minded look at the UFO phenomenon. Smith's urging his peers to accept the strange and mysterious "discrepancies" as the starting point for serious research has echoed down through UFOlogy in the decades since but has sadly remained mostly unheeded. Smith went on to explain that the data he and his team had to work with consisted largely of sightings reports as observed throughout Canada. This included many reports from the field representatives of the Department of Transport, whose job it is to watch the sky and who are trained to do precisely those kinds of observations. Useful data was also obtained from instruments, such as those at ionospheric observatories. But Smith cautioned against expecting too much from the field stations because of the very sporadic nature of the sightings. And laboratory studies were useless without some kind of specimen with which to experiment, and it was not likely that such a specimen would be obtained any time soon. So, according to Smith, we are then forced to rely on "deductive reasoning," at least until it is possible to work out procedures more in line with conventional experimental methods. WHAT WAS THE GOVERNMENT HIDING? In 1950, prior to the establishment of Project Magnet, Smith was attending what he called "a rather slow-moving broadcasting conference in Washington D.C." He had some time on his hands so he circulated around, asking a few questions about flying saucers. "Which stirred up a hornet's nest. I found that the U.S. government had a highly classified project set up to study them, so I reasoned that with so much smoke maybe I should look for the fire." 1. The matter is the most highly classified subject in the U.S. government, rating even higher than the A-bomb. 3. Their modus operandi is unknown but concentrated effort is being made by a small group headed by Dr. Vannevar Bush, who some maintain was the initial guiding force behind a secret government cabal known as Majestic 12, created to monitor a number of UFO crashes, including the one in Roswell, NM (circa July, 1947) in which several alien bodies were recovered from the wreckage. It was Bush and company's purpose to foil the flow of information on the UFOs to the American public and to literally censor the truth about the arrival of ETs on our planet. 4. The entire matter is considered by the United States authorities to be of tremendous significance. "I am 48-years-old, hold a Master's Degree in Electrical Engineering, occupy a responsible position in the Canadian government, hold half a dozen patents, am author of several technical papers, and in general enjoy a background in technical work and science indicating at least an average competence to study and report on phenomena of a scientific nature. I have tried so far as possible to use conventional and standard methods and equipment to investigate all possible angles before drawing any conclusions. In other words, I have followed the same general procedures which I would have followed if I had undertaken to study some more prosaic subject, such as radio wave propagation." One of the foremost revelations in "Project Magnet" is Wilbert Smith's report that he was told by U.S. officials on his various visits to Washington that they had retrieved at least one UFO that had crashed in the Southwest at Roswell and were examining the remains of the corpses of several alien bodies found within the wreckage (unconfirmed). The revelation to Smith that a craft from outer space may have crashed in the desert is said to have stunned him at first, but later he came to take such bombshell events in stride. As stated above, American scientists had gone so far as to declare that the existence of flying saucers should be kept more highly classified than the development of the atomic bomb. Because of these revelations, Smith went back home to appeal to his superiors not to let the Americans pull ahead in their findings about these flying discs and urged that Canadian researchers begin their own official study, which was quickly established under the "code name" Project Magnet. The story of what Project Magnet uncovered is a major part of this just released tome edited by publisher Tim Beckley. 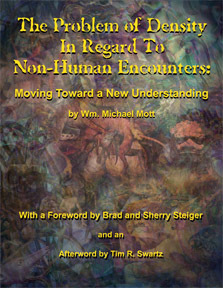 The book also includes updated revelations by contemporary researcher Grant Cameron (PresidentialUFO.com) as well as a bonus history of humanoid and creature sightings and close encounters throughout Canada by the late amateur astronomer John Musgrave, who worked while on a grant from Ottawa's government. Perhaps the most exciting part of this book is the disclosure that Wilbur Smith was a UFO contactee himself and was in touch with others on a regular basis who claimed to have received communications from off-earth dwellers. It is important, in the light of where his studies would eventually take Smith, to establish his credibility as a pragmatic scientist approaching the UFO subject in the utmost of "real world" terms. Smith explains, "If we are to rely on sightings data alone, we are bound to get a rather one-sided idea of these creatures. For example, we see saucers traveling at terrific speeds and then suddenly stop or change direction. Under our concepts of physics, no creature of flesh, blood and bone could withstand the terrific forces which would be associated with such actions. Therefore we are led to assume that the saucerians must be some manner of robot or a creature the like of which we have never encountered." But such speculations don't necessarily lead us to the truth, according to Smith. Fortunately the UFO occupants HAVE made contact with certain earthlings deemed to be capable of receiving the information and passing it along to others. Along with the many sightings reports Smith began collecting and analyzing claims of contact with the aliens and to assemble what he felt were the mores and ethics of the people from the flying saucers. "It adds up to a complete and elegant philosophy," Smith wrote. "These people tell us of a magnificent cosmic plan, of which we are a part, which transcends the lifetime of a single person or a nation or a civilization - or even a planet or solar system. We are not merely told that there is something beyond our immediate experience; we are told what it is, why it is, and our relation thereto. Many of our most vexing problems are solved with a few words; at least we are told of the solutions if we have the understanding and fortitude to apply them. "We are told of the inadequacies of our science," he continued, "and we have been given the basic grounding for a new science which is at once simpler and yet more embracing than the mathematical monstrosity which we have conjured up. We have been told of a way of life which is utopian beyond our dreams and the means of attaining it. Can it be that such a consistent, magnificent philosophy is the figment of the imaginations of a number of misguided morons? I do not think so." If such is the case and all of this is known, the reasonable person asks, then why has it not been publicized? Why aren't we studying the sciences gifted to us by the aliens instead of atom bombs? The answer, Smith tells us, is that it HAS been publicized. Books have been written and thousands of copies sold. There are many periodicals available containing this knowledge, which may be had for a nominal sum. Reports have been prepared by serious investigators and presented "through the proper channels." THE FLYING SAUCERS AND THEIR ABILITY TO CHANGE "REALITY"
"But it is truly said," Smith acknowledged, "that one can lead a horse to water but one cannot make him drink. There are probably as many private reasons for not facing up to the facts as there are people who refuse to do so. However, it is consoling to realize that, through the humble and often criticized comic strip and science fiction stories, the younger generation is being conditioned to accept the reality of people from elsewhere, and when given the opportunity to do so avidly assimilate all they can get on flying saucers and the people who fly them." One is struck by the overwhelming transformative power the study of UFOs and their occupants often has on people. Smith's interest in flying saucers began as a mild case of curiosity and over a few years became something like a religious fervor. In a portion of Smith's writing collected in "Project Magnet," entitled "The Battle for Man's Mind," he feels called upon to warn his readers about a grave danger we are all facing, either consciously or unconsciously. Two great forces are striving to gain control of man's mind, a struggle that has been going on from time immemorial. "But never in the world's history," he wrote, "has the conflict been more intense than it is in this present era of confusion and unrest. In the old days, mankind was often made to suffer physically, unspeakable things in the name of power. But today, with man's mind more developed and better educated, he is now facing the prospect of a refinement of even greater mental and spiritual cruelty - unless he is prepared to protect himself with right thinking." Man's brain, Smith teaches, operates on the metaphysical plane like a two-way radio, transmitting and receiving messages along the airwaves of the universe. [This is a very apt metaphor, when one considers that Smith was a government expert on radio broadcasting.] Man's brain is open to both good and bad input, which he either accepts or rejects according to his stage of evolution. 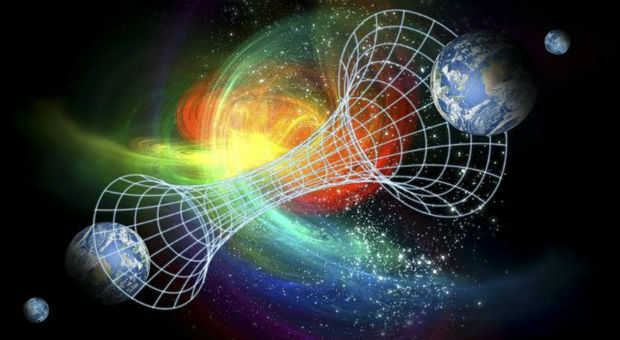 "Thus we are being bombarded from the metaphysical plane by two conflicting schools of thought," Smith wrote. "And free will being the criterion of spiritual advancement, it is left to us which we choose to accept. However, from a purely logical point of view, if we want to save ourselves a lot of sorrow both in this life and lives to come, we should arm ourselves mentally against the onslaught of negative thoughts." So "Project Magnet" is more than mere nostalgia. It demonstrates a near prescience on the part of Wilbert Smith, who clearly saw into the nature of our troubled times and the constant struggle our minds are required to muster against evil thought forms and ideas. "I have added relevant material from numerous contributors, as well as from both new and archival sources" Beckley writes. "Grant Cameron (the only provider of reliable "Disclosure" updates as far as I am concerned) is a vast depository of knowledge on Smith, being a Canuck himself, and has been exceedingly helpful in my compilation. And since Smith is certainly the most important figure in Canadian UFO history, no work on Project Magnet, as far as I am concerned, would be complete without a little known manuscript I personally published in 1979 by John Musgrave, which is a chronicle of humanoid and critter encounters North of the American side of the border. I was upset to learn Musgrave went into spirit a number of years ago. 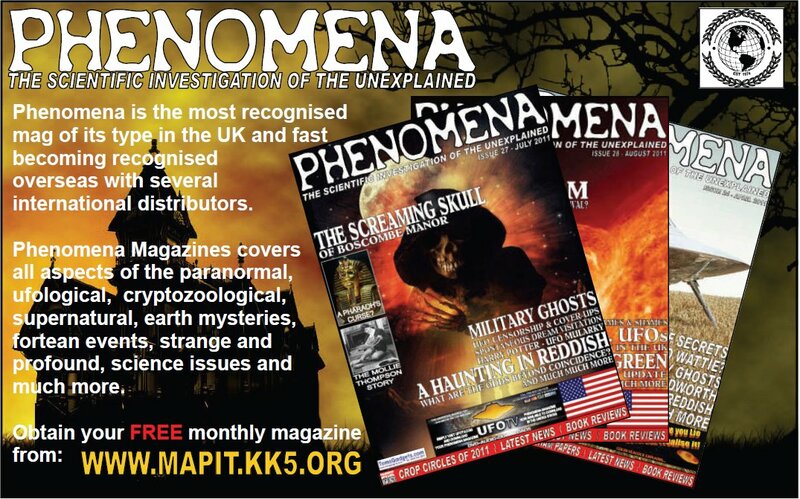 His work is one of the best catalogs of UFO encounters of the third kind ever published, and it certainly should be shared with contemporary researchers of UFO lore, as it makes the subject of Project Magnet as complete as it could possibly be." So maybe you should choose, of your own free will, to buy a copy of "Project Magnet"? It couldn't hurt, really, to read how Wilbert Smith's scientific study of flying saucers grew into a spiritual devotion to his fellow man and to the God who teaches us to love one another. Smith believed UFOs utilized the magnetic polarity of the earth to propel themselves through our atmosphere. Official Canadian government document regarding Project Magnet. The Mandela Effect is a very curious phenomenon that was named by Fiona Broome, a paranormal consultant. Broome discovered that she and possibly thousands of people shared what proved to be a false memory. 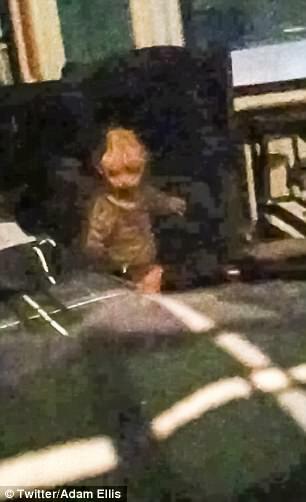 NY Cartoonist Haunted By "Demon Child"
A New York man who claims he is being haunted by the ghost of a demon child has shared the latest in a series of chilling updates regarding unexplained happenings inside his apartment. Adam Ellis has been chronicling the ghostly activities of the entity, whom he says is called Dear David, since August on his Twitter account, which now has 666,000 followers. Earlier this month, Adam began hearing mysterious noises coming from his roof and decided to investigate them, which led him to make his newest creepy discovery. 'The other week, I was tweeting the most recent update from the living room couch. About 30 seconds after I'd sent the last tweet, I heard a thump directly above my head, as if someone above me had dropped something on the floor—which is impossible, since I'm in the top apartment,' he wrote. 'There's also no way to access the roof. There aren't any ladders on the outside of the building. The only way you'd get on the roof is through a skylight in the hallway. There are no trees in the immediate vicinity, either. Adam then explained that there is a 'mysterious' hatch extremely high up on the ceiling of his hallway, which he never paid much attention to until the noises started occurring. Determined to get to the bottom of the situation, Adam bought a long pole for $38.99 on Amazon and waited for it to be delivered. The cartoonist also noted that it seems like there are three feet of empty space between the hatch and the roof, and the hatch is on the same level as all the ceilings in his apartment, which could suggest that there are three feet of empty space above his home. Adam didn't tweet for a few days, but returned after Thanksgiving to announce his pole had been delivered and the noises were still happening. 'I'd barely fallen asleep when I woke up to an INCREDIBLY loud crash above me,' he wrote, recounting a recent occurrence. 'It sounded like someone had dropped a bowling ball. I bolted upright in bed and immediately felt strange. There was a weird energy all around me. I can't explain it. 'After about a minute I heard another crash. I briefly thought about grabbing my shoes and booking it, but that would mean passing under the hatch, and that seemed like a bad idea. So instead I just listened and waited, though I'm not sure for what. 'The crash happened again, and then again—probably 15 times in a row, followed by a long silence. Then I heard a smaller, creaky sound from the hallway. In my mind I registered it as a footstep, but it really could've been anything. But on his way out, Adam noticed debris on the stairs, under the mysterious hatch. When he looked up, he saw that something appeared to have gotten caught in the opening. He then set up his video camera and went to fetch his pole to poke the hatch open. 'I set my camera on the coat wardrobe at the top of the stairs and hit record, just to make sure it would be caught on video if a demon burst out of the hatch,' he wrote. When Adam poked the hatch, it opened, and he was terrified to see something fall on the ground. 'I jumped out of the way and practically fell down the stairs trying to dodge whatever it was that fell. At first I thought it was a dead squirrel, which would honestly explain a lot. It hit the steps and bounced down to the first floor,' he recounted. However, open closer inspection, the objected turned out to be a small leather shoe that looks significantly worn-out. After the discovery, Adam texted his landlord, who came back with a ladder and a flashlight to take a closer look inside the crawlspace. 'I stared up at him, half expecting something to grab him and yank him into the darkness. He angled his flashlight all around and finally saying, "There's nothing up here," ' Adam recounted. The item was a marble, which Adam said had 'a little bump on one end'. 'My landlord seemed unbothered for the most part (uhhh ok dude) and he told me to call him if I heard anything else. I went inside and headed to my office to see if I could figure anything out about this marble that somehow made its way into my ceiling,' he added. Adam hasn't been able to figure out much about where the shoe and the marble might have come from, and remains thoroughly confused as to the unexpected happenings that he says keep unfolding in and around his apartment. Earlier this month, Adam shared images of what he said was Dear David staring at him and shuffling towards him in his bedroom. 'It's been about four months since the first time I dreamed of David,' he tweeted. He then said that while dreaming about Dear David, he felt mostly paralyzed but managed to move just enough to grab his phone and start snapping pictures. 'Sure enough, he crawled down off the chair and began shuffling toward me. He moved slowly, like it was a struggle for him,' Adam wrote. 'I felt terrified, but I kept taking photos. David limped closer toward me, never taking his eyes off me. Soon I was face to face with him. 'He started muttering something, too quiet for me to understand. I watched as his eyes rolled back in his head, until they were all white. 'I tried to writhe away from him, but I could barely move. I stared in horror as he began crawling up onto my bed, still murmuring something. Later during that day, Adam took a look at the photos on his phone and, according to his account, saw several black images. He shared the snaps with his followers, warning them to up the brightness, and naturally, the spine-chilling photos all show a terrifying figure reminiscent of Dear David crawling towards him, just like it did in his dream. Adam's story began with a series of very vivid dreams featuring a child with a misshapen head sitting in a green rocking chair at the end of his bed, while he terrifyingly experiences sleep paralysis. He mistakenly asked a third question before waking up petrified. He researched online looking for boys who died in stores in the city but found nothing. Adam eventually moved into a larger apartment upstairs from his own and months went by without any sight nor sign of Dear David until suddenly his cats began acting strangely. Adam also claimed that he had been getting phone calls from an unmarked number and when he answered once he heard the noise of static before a small voice whispered 'hello.' Terrified, he hung up the phone. Unsurprisingly, Adam's ghost story has proved a riveting read for many users, and the first tweet of the thread has been shared more than 55,000 times while attracting plenty of ghost-fighting advice from strangers including 'finding the remains' of the child and 'burning them' or spreading salt around his apartment. Police Catch Man Prepared to Battle "Lizard People"
PARKLAND, Wash. -- A 55-year-old Eatonville man armed himself with an AK-47 and a pistol over the weekend to battle "the lizard people," the Pierce County Sheriff's Office said. A number of troopers and deputies converged. The man put the guns back in the car. He was ordered to the ground, where he began to scream about "sending in the news" and "the lizard people," the Sheriff's Department said. He resisted when officers tried to handcuff him. A trooper and a Sheriff's Department deputy both used a Taser on him, the Sheriff's Department said. The Sheriff's Department says the man told a deputy that he had "snorted methamphetamine to lose weight" and that he was taking prescribed morphine. "The meth doesn't make me crazy, man," the Sheriff's Department says the man told the deputy. "The lizard people are real!" He said President Trump had called his house in Eatonville, warned about the lizard people and said the "alpha dragon" had taken his family hostage. 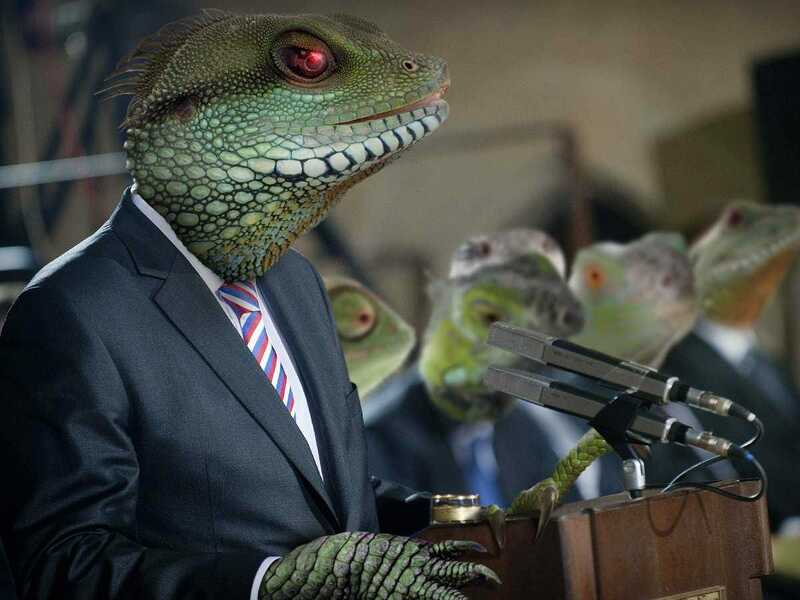 The man explained that he stopped at the Parkland intersection because the lizard people had surrounded him and because he needed to follow the president's directions to fight them. He made a scene to attract the news media so "his story could be documented for history," the Sheriff's Department reported. A deputy found a loaded AK-47 and a loaded .357-caliber pistol in the man's vehicle. There were five loaded magazines for the AK-47. Counting the extra magazines and the one in the rifle, there were 172 rounds, the Sheriff's Department says.